Back in the mid through late ‘90s times were tight in our house and my parents decided cable television was a luxury we could do without. This meant basketball obsessed me only got to see my beloved Pistons and occasionally games on NBC towards the end of the season. I’ve never been an evening news watcher --it’s always depressing-- so I didn't get a lot of out-of-market highlights from around the NBA, because with no cable there’s no SportsCenter. For this reason I looked forward to each Saturday afternoon to NBA Inside Stuff hosted by Ahmad Rashad to feed my Basketball Jones. I would even often times record the episodes so I could watch them again because I was that obsessed. I really liked the show’s format. The “Rewind” segment was probably my favorite where they would recap the best action from the previous week from around the NBA. There was also “Jam Session” where they’d do a montage of dunks set to popular songs. In addition Ahmad would also do interview segments with players that would give you insight to their personalities and interests away from the court. They packed a lot into their 30 minute time slot and it was always upbeat and entertaining. As a way to promote Inside Stuff and their new partnership with NBC the NBA allowed Ahmad, a former NFL player, to suit up for the Philadelphia 76ers and log a couple of minutes in a preseason game against the then expansion Minnesota Timberwolves. Eighteen thousand plus turned out to Minneapolis’ Target Center for this preseason game to see their new franchise take on the Sixers and a guy who played wide receiver for their Vikings from 1976 to his final season in 1982; making the Pro Bowl from 1978 to 1981. For his part Ahmad went one-for-one knocking down a 20-foot jumper in his couple minutes of play. The Sixers won the game 102-96. The footage, which included Sixers’ practice, was later used as a segment on NBA Inside Stuff. 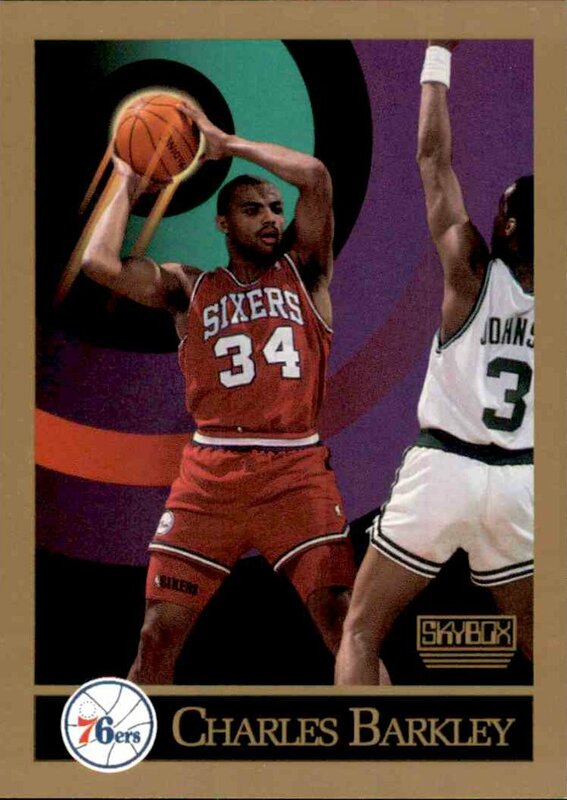 For this card I’ve chosen a 1990-91 Skybox inspired design. This was Skybox’s inaugural basketball set. The cards featured a more premium look than that of NBA Hoops or Fleer. They were packaged in foil packs and featured action photos with state-of-the-art (for the time) computer graphic backgrounds. The card back featured a candid photo of the players with very minimal statistical information. I remember collecting these back in 1990. I want to say they were a later season release if I remember correctly. They were okay but I much prefer the NBA Hoops release from this year with Fleer bringing up the rear, the wayyy rear. 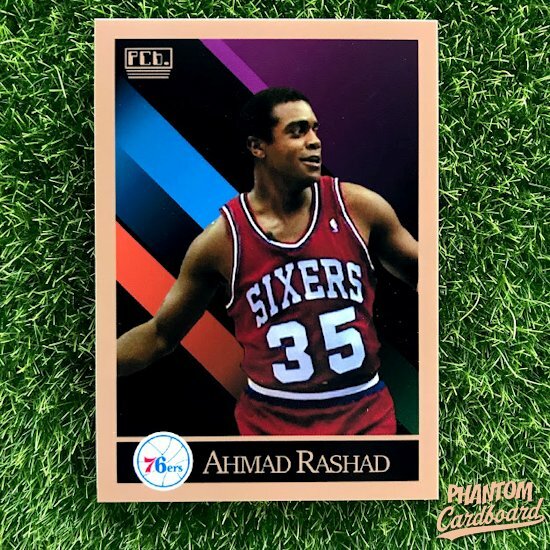 I’ve actually been wanting to use this design for the longest time now but nothing really made sense to me; which is why I was thrilled when I came across the photo of Ahmad in Sixers gear and learned it was from 1990. I love the way this one turned out, it’s exactly the way I pictured it in my head. With my satisfaction from this card I’ve got another project planned for this template. It’s a long term one though because the design takes a little more time and the subject is season specific. No more hints.